This entry was posted in American history and tagged Civil War, Haper's Ferry, John Brown, slavery by organicpeas. Bookmark the permalink. Hmmmm. It’s hard to condemn a man who believed what he was doing was from God. Besides, slavery was a moral stench on America. Given the two choices, I’d say martyr. If you can escape the twisted Southern bias promoted since Harpers Ferry and research the real History of this unsung martyr you’ll find that Almighty God has had the last word. Brown’s credentials are impeccable in this regard and if anyone has cause to believe otherwise please so respond in truth. Having been a lifetime Virginian and scorned John Brown all my life on the basis of hearsay I’ve have since found the rest of the story to be contrary. He was always a Godly man called for this purpose. 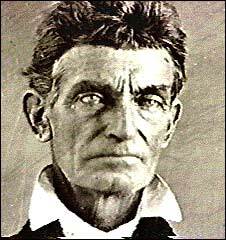 As a great-great-great granddaughter of John Brown, I have to vote for Martyr. As watchman said in his comment, do the research and you will find that he was a man who gave his life to further the fight to abolish slavery in America. His utmost weapon was always “Do unto others as you would have them do unto you.” All PEOPLE were equal in his eyes, regardless of gender, color, religion. He’s about as true a christian as Jim Jones was, and can be compared to the fanatical jihadist of present day. Epic fail.